ACTAMEDYA: live television coverage in Istanbul. Istanbul, July 2016: Two thousand swimmers from 70 countries took part in this year's 28th Samsung Bosphorus Cross Continental Swim - and the live television coverage was handled by ACTAMEDYA. The race on July 24th involved the participants swimming the 6.5kms from the Asian side of Istanbul to the European side. 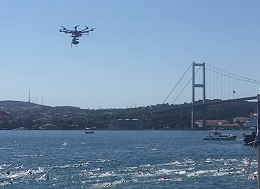 To capture the event, ACTAMEDYA used 12 cameras at the start and finish points as well as two octocopters (drones) via RF links on boats. In total, a team of 35 people was used in order to produce the two-hour live signal which was broadcast on Ntvspor live. ACTAMEDYA is highly experienced at producing live events that require RF systems and special cameras such as marathons, cycling tours, motorcycle races and rallies. Since 2011 ACTAMEDYA has been providing the broadcast infrastructure for national and international events such as the Istanbul Marathon, the Istanbul Half- Marathon, Presidential Cycling Tour of Turkey, Adana Half-Marathon, Motocross Championship and the Archery Championship. ACTAMEDYA has also been producing the main broadcast signals for basketball and football matches, as well as providing unilateral productions for national and international broadcasters.